Living a Crafting Life: Scrapbooking Process: Using up Stash! This past week, I have been going through all our digital photos, making sure they were organized properly and saved all in one place. The process included going through various CDs, my hubby's computer files, my computer and our external hard drive. It was quite the job, but I have now compiled what I figure to be all the important family photos in one spot on our external hard drive, by year and by month, with all duplicates and renegade photos accounted for. The phone photos were the hardest -- before owning an iPhone, the dates were not recorded on the photo files, so I had to match those photos to others where clothing and haircuts were similar! Now that this job is finished, I feel as though important photos will no longer be missed that need to be scrapped. Not that I will scrap all of them -- but I knew there were some random shots that told fun and interesting stories that needed to be in our albums. Here is one of those stories: My husband took our oldest son, when he was 5, for a very short, shaved, barber shop haircut that nearly gave me a heart attack at the time. Looking back now, he was stinkin' cute! As you'll see from the finished layout, things didn't go quite as planned! First, I ditched the second photo. Since one photo was portrait and the other landscape, I couldn't find a way to bring good continuity to the layout using both. 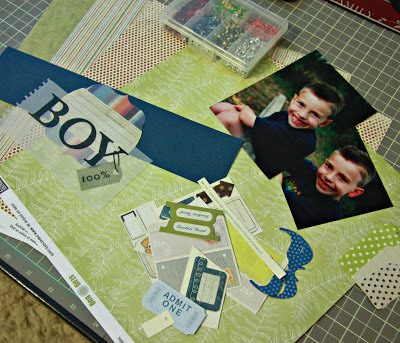 Second, I turned the layout so that the long border grounded my focal photo better. A switch of Paper Loft paper from greens to blues were brought in as well as a chipboard set from Basic Grey that I bought awhile ago at Big Lots and never used. Since frames are making a big comeback, the rust colored frame from that set worked extremely well with my chosen papers. Finally, I brought in just a couple new items (I couldn't resist) to rev up the final layout: a wood veneer and title letters from the Basic Grey "PB & J" collection. Journaling will be added on a tag and tucked behind the photo later. Notice the Urban "tag" that I used on my layout? Rummage your home for things like this for your own ephemera. Hope this gives you some inspiration as you scrap this week! What's your page layout process?? 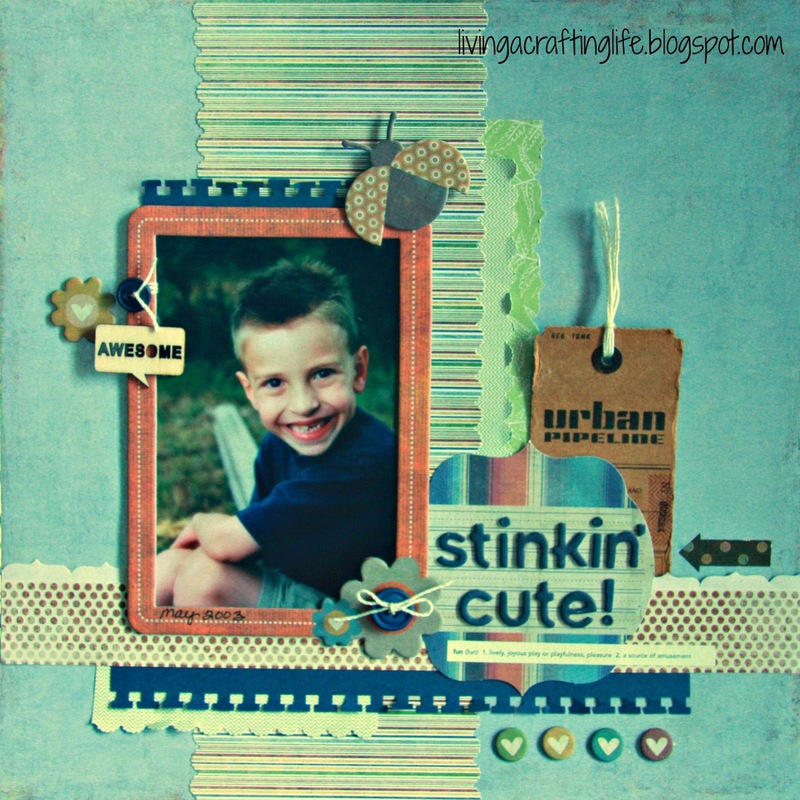 That's one stinkin' cute page for sure!